Tons of this set of forgery strips has been offered and is presently being sold on eBay by user balticamber2011. They have been sold by armi777 and asrm10 as well. All these users are associated and based in Latvia. All know these are forgeries but persist to this day to sell them. I already created a page showing all the souvenir sheets from this series that have been forged. 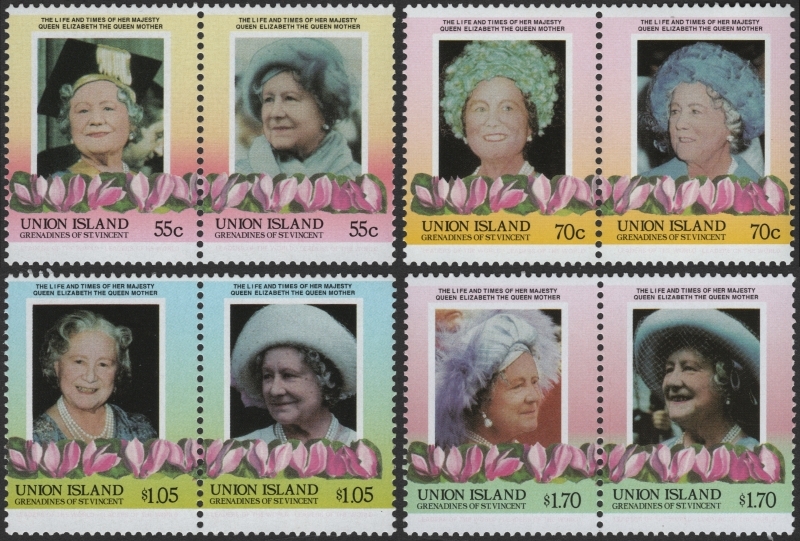 During that time I did not obtain forgeries of the single stamp issues for Union Island. I have now. I have recently discovered that modern fake stamps of this issue are being flooded onto the market. I can tell you that real dangerous	fakes or some call forgeries are being flooded on the market as I write this page in September of 2017. 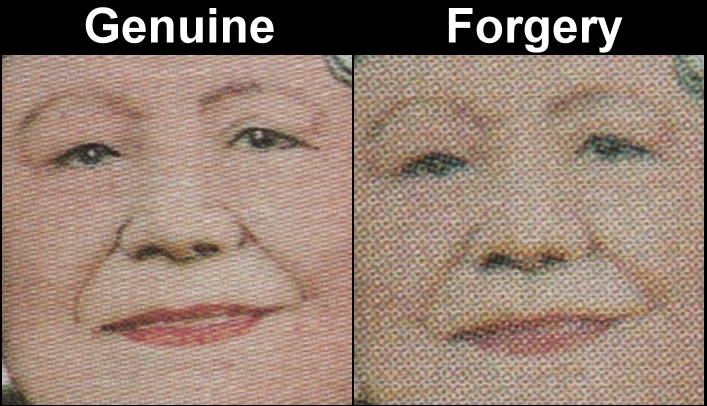 The set, souvenir sheet and imperforates imaged above are completely fake! My research into the printer has enabled me to discover modern fake stamps have been created in 2014!! They are being spread across the world through online auction sites like ebay and Delcampe. Everything about them is fake except for one dangerous fact, they have the correct perf size. The gum type is different in it being white in color and very shiny. This gum type was not used until much later years, long after Format went bankrupt thus proving they were not produced by the Format International Security Printers. Obvious differences will be shown below. So far I have discovered complete sets of perforated and imperforate forgeries of the Saint Vincent Grenadines Union Island Queen Elizabeth Leaders of the World 1985 85th Birthday issues. All are/have been offered online right now as I write this on September 2, 2017. 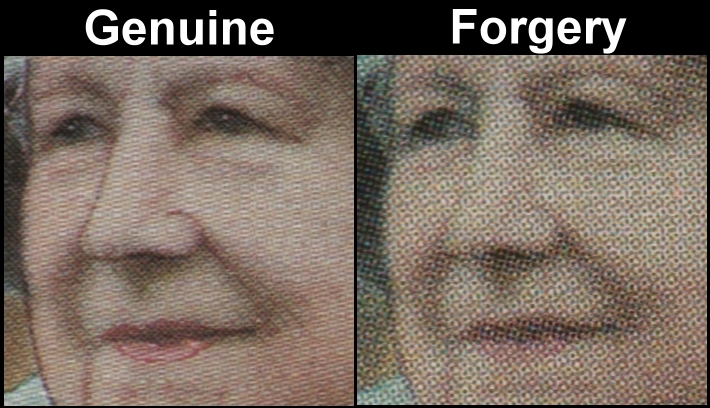 I purchased the above imaged set of perforated forged stamp pairs from a dealer in Canada who did not even realize that they were forgeries. I purchased them recently along with many other sets which have all proven to be the same type of forgeries I have documented over the passed two years. The souvenir sheet forgery I received in a bulk lot of 5 from Latvia based seller asrm10 on eBay in January 2016. I will use the 55c values for comparisons using a original specimen from a set of specimen overprinted stamps I purchased recently from a reputable dealer in the UK. You can see that the fonts on the genuine stamp are slightly bolder. There are two consistent differences that you can see in the image. Both are constant on all the values of the set. The first is the top of the "S" touches the "T" in "ST." on the genuine stamps. It does not touch on the forgeries. The second is the top of the "C" does not touch the "E" in "VINCENT" on genuine stamps. It touches on the forgeries. Also the forgeries have an arrow point on both ends of the "C" whereas the genuine stamps only have it on the top. You can see this stamp pair is dangerously close looking at this size of image. The side background colors look almost the same. 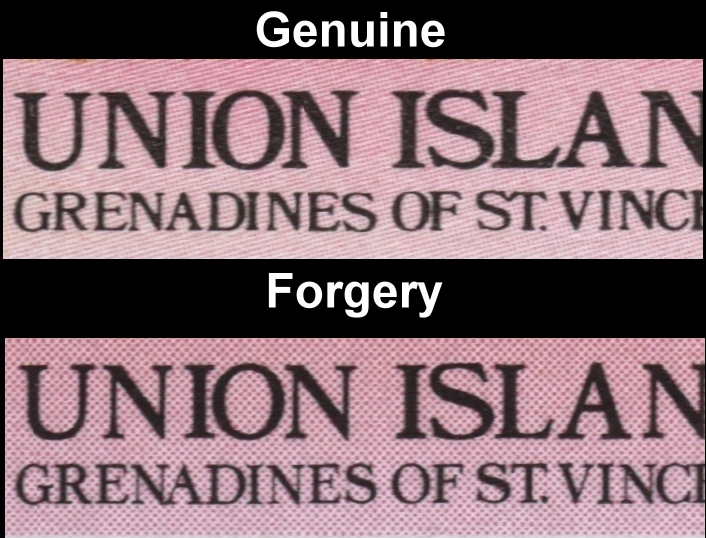 The country name and value background is light pink on genuine stamps versus a darker pink on the forgeries. On the right stamp the queens hat is shades of blue on genuine stamps whereas it is shades of very light green on the forgeries. Although hard to see in images, the "dot" between the "Leaders of the World" logos is much larger on the genuine stamps. The side background is shades of yellow to pink on the forgeries. The side background is shades of red on genuine stamps. The queens hat on the right stamp is shades of blue on genuine stamps versus green-blue on the forgeries. The country name and value background is very pale yellow on genuine stamps versus dark yellow on the forgeries. Again, although hard to see in images, the "dot" between the "Leaders of the World" logos is much larger on the genuine stamps. The side background is shades of light green to light blue on the forgeries. The side background is shades of bright yellow-green to light green on genuine stamps. 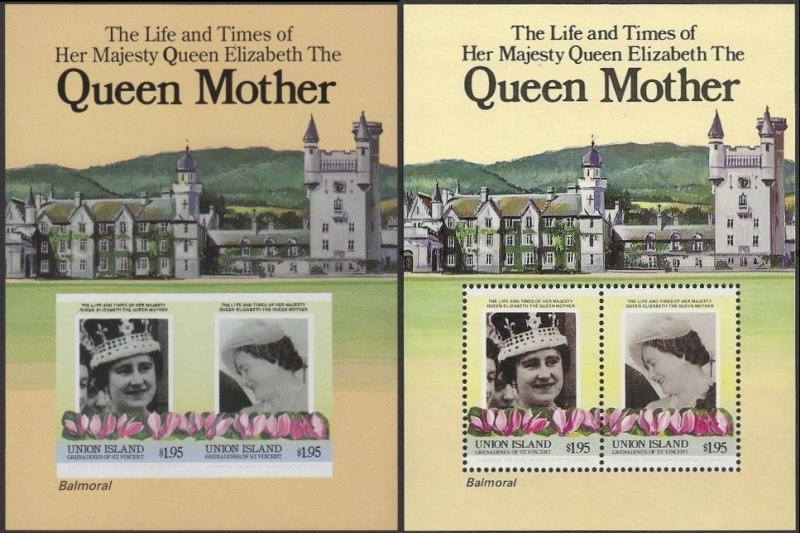 The queens hat on the left stamp is shades of blue on genuine stamps versus shades of light green on the forgeries. The queens hat on the right stamp is much whiter and the bow is bright reddish-lavender on genuine stamps versus dull lavender on the forgeries. The country name and value background is very light yellow-green on genuine stamps versus dark yellow-green on the forgeries. The side background is shades of light red to very light red on the forgeries. The side background is shades of orange-yellow to light pink on genuine stamps. The queens hat on the right stamp is shades of blue on genuine stamps versus shades of greenish-blue on the forgeries. The country name and value background is light yellow-green on genuine stamps versus light green on the forgeries. Once again, although hard to see in images, the "dot" between the "Leaders of the World" logos is much larger on the genuine stamps. I noted at the start of this page that I had already created a general page showing numerous forged souvenir sheets from this issue. 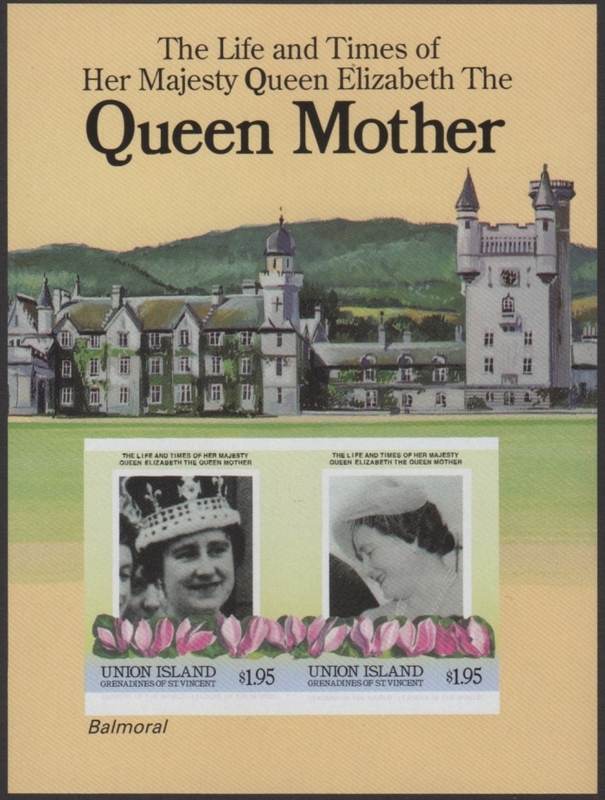 DO NOT BUY IMPERFORATE 85TH BIRTHDAY SOUVENIR SHEETS! The first and basically the only reason the imperforate souvenir sheets of the 85th Birthday issues as imaged are fakes is because until now they did not EXIST!!!. They never were on the market until these last few years. Only archival examples from some countries have ever been offered on the market. Those being from press sheets or in presentation folders by the printer. All of a sudden 30 years later these appear! So you don't smell a rat? Imperforates of the Saint Vincent souvenir sheet did not exist until now. Archival pieces were found but they are perforated and come from the press sheet with large selvage (imperforate) around them. 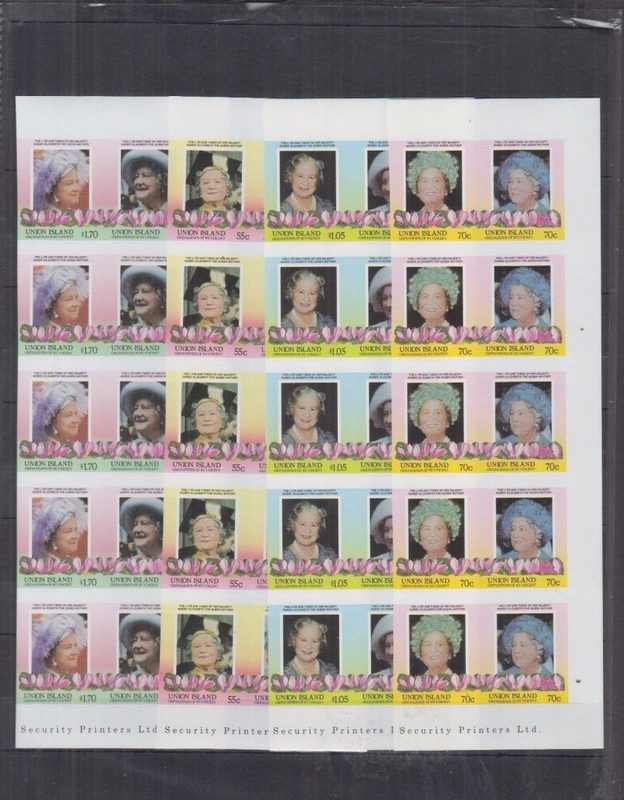 You can now define the fake Saint Vincent Grenadines Union Island 1985 Queen Elizabeth 85th Birthday stamps and souvenir sheet easily and can now possibly avoid being ripped off! Sorry to say this, a lot of you already have been fooled and more of you will be until the right people get serious about it!